Patron accounts are required for patron participation in discussion board threads and blog post commenting. If you don't want to create an account for every patron, you can allow your patrons to register for their own accounts. 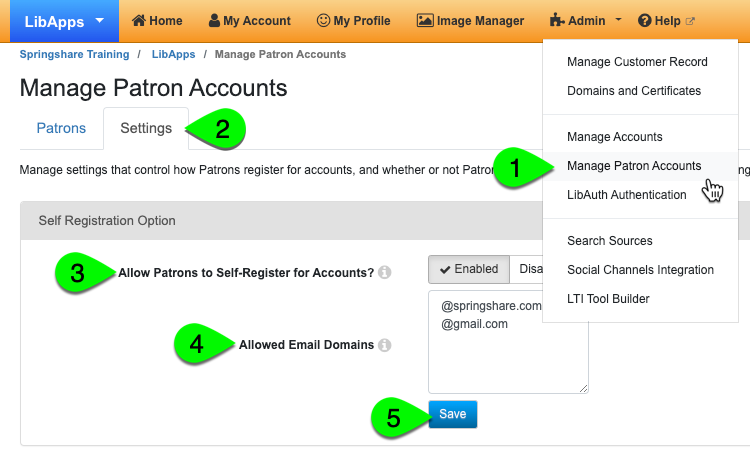 In the Self Registration Option box, click the Enabled button for the Allow Patrons to Self-Register for Accounts? field. In the Allowed Email Domains field, add the email domain(s) for email addresses that can be used to register for a patron account. At least one domain is required. Domains should be entered one per line and include the @ character. (ex: @springshare.com). After enabling the option to allow patrons to register for their own accounts, a link to create an account will be displayed (prior to logging in to LibApps) when attempting to reply to a discussion board thread or comment on a blog post.